Malware makers, phishers, they really are all out to get you. Even though Android itself is a fairly secure platform, some data about your phone’s settings and usage is sent to Google’s servers. 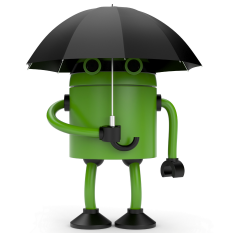 But here is how you can keep your Android smartphone secure from data collection. Device manager allows you to track down a missing Android phone. You can easily locate a missing android device by simply clicking on “find my Phone” or trigger a remote wipe and it will wipe all the entire data on that smartphone. Biometric authentication methods like fingerprints and retinas are designed for convenience, not security. If you want to keep the data on your phone as safe as possible, you need to set a lock that only you know. If you don’t like this, you can simply disable ‘activity tracker’ by going here. Just turn off all categories and you are good to go. Finally, Tech experts also advice that you should always switch search engine or switch browsers for security reasons. Thanks for the info, it will come in handy. Noted, this information will come handy one day. Oops, it was an oversight. Forgot to add the link but now corrected. Security is the prime reason Biometric authentication methods like fingerprints and retinas are designed. Thanks for the security tip. Admin pls help, i reload my infinix hot2 using the power button and volume key, but when reloading (startup) am always stucked in a step requiring wifi network to load the next page after selecting the language……. Pls what can i do?? its simple, if you have another device or someone closer to you, tell them to turn on their hot spot, connect to their hot spot to set up your device. After the set up, you won’t be needing the wifi again.